Could the Apple iPad cripple you? The Apple iTablet: pain ahead? I've been up since 4am, woken yet again by the tingling in my hands as my fingers go numb. I've been to the doc about it. She says it's Carpal Tunnel Syndrome, one of the nastier forms of RSI, and I know what's causing it: it's my iPhone. I've had RSI for years, but for a long time I've kept it at bay with good ergonomics, carefully chosen keyboards and mice and regular breaks. The iPhone has changed all that, though: when I'm not at my desk I'm giving my phone a damn good thumbing, scrolling through RSS feeds or catching up on tweets. And that's seriously damaging my hands. For all its joys, multi-touch can be an ergonomic disaster area. Could the Apple iPad be even worse? I think it could. We'll be getting a 9.7-inch touchscreen boasting multi-touch and a virtual keyboard, and if it's anything like the one on the iPhone - which I'm sure it will be - then that virtual keyboard's going to take up roughly half of the screen. It's easy to see what that would be like: find a 10-inch netbook and imagine the keyboard has been scaled down 50% and all the keys glued to the case. Don't have a netbook handy? Take a sheet of A4 and fold it in half to make it A5. Now, fold it again so it's wider than it is tall. That's your keyboard. Try typing on it. Maybe throw in some finger scrolling, some pinching and grabbing too. Uncomfortable, isn't it? It can't be anything other than uncomfortable at that size, because there simply isn't enough room for properly sized keys like the ones you'll find on Apple's current (and exceptionally comfortable) keyboards. It's likely, then, that typing on the iPad will be uncomfortable. At the risk of sounding like a character from The Day Today, Uncomfortable plus time equals pain. Although tablet computing isn't exactly new - it's been around in PC form since the turn of the century, and of course we've had stylus-based computing in PDAs for years before that - decent tablet computing is a brand new thing. 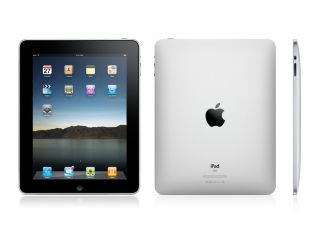 If Apple's iPad is as good as all Steve Jobs claims, then people will be spending an awful lot of time using it. Do we know what the consequences of that will be? Has Apple been testing it with numb-fingered people like me to see whether it exacerbates RSI? I'd love to think so, but I very much doubt it. But let's face it: if this thing costs a thousand quid I'm not going to be in the market for one any time soon. But the odds are that, as with the iPhone, some iPad lovers are going to discover that love hurts.